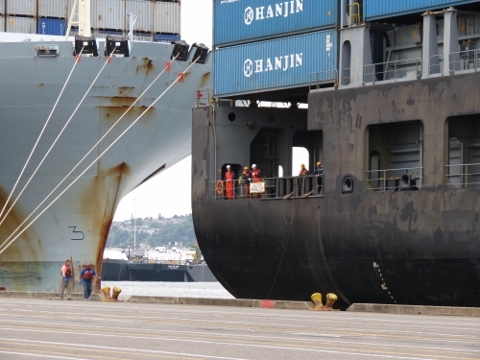 Earlier this month, we got a chance to tour the Hanjin Oslo at Seattle’s Terminal 46. 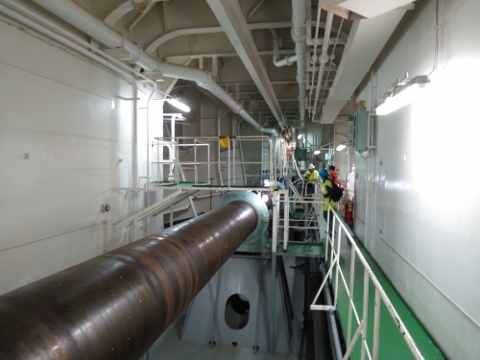 We had an incredible time–we watched the ship come in, toured the yard, and best of all, were given a detailed onboard tour that included the machinery. 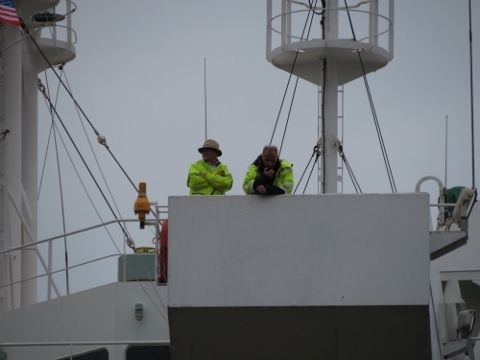 The above photo of us on the bridge wing was taken by Peter Kim, who supervises the Hanjin shipping container ports in the Puget Sound and Vancouver, WA. 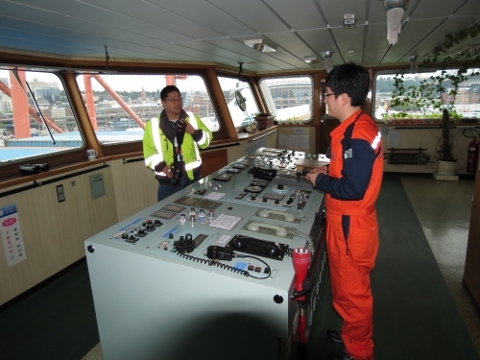 Peter knows the Hanjin and port operations well–his detailed explanations of how things work and the equipment involved really added to our enjoyment of the visit. 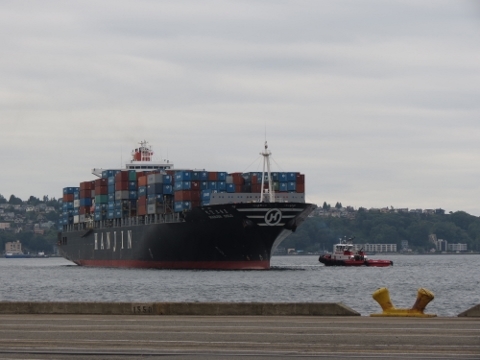 We left Bell Harbor Marina as the Hanjin Oslo was entering Elliott Bay and arrived at the terminal in time to watch the ship dock. The ship of course is huge, but the size and scale is really obvious when it’s next to other vessels. 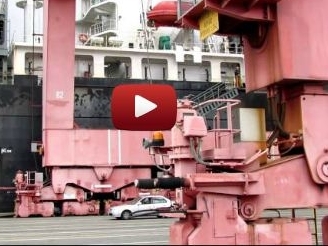 The 915-foot ship dwarfs the roughly 382-foot ferry Kaleetan to the stern. And that “small” tug off the bow is the 98-foot Crowley Tioga. 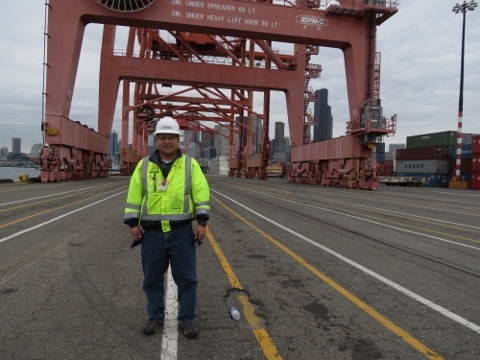 Peter Kim, the port supervisor, is pictured below left with those huge gantry cranes behind. 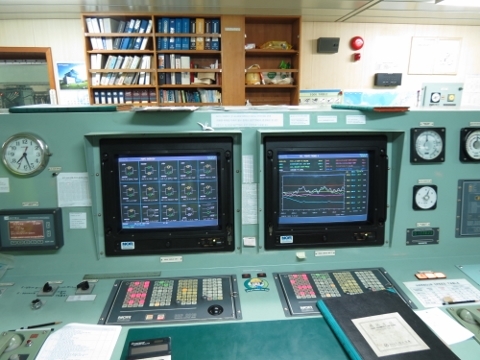 The “BRIDGE” sign in the righthand picture indicates where the bridge of the ship should go. That car Peter is standing next to also marks the location. 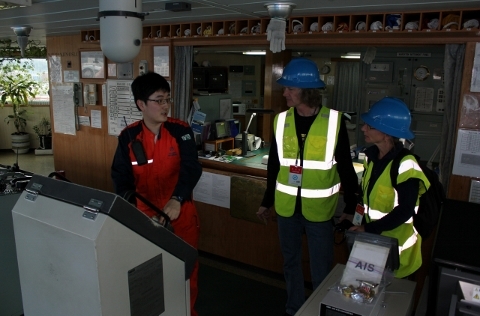 As the ship approached the dock, the caption (in the hat on the left) and the pilot directed the docking from the bridge wing. 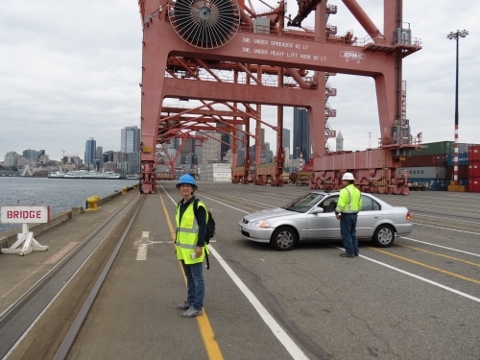 It was a tight sqeeze–Peter wanted the ship to dock about 100 feet in front of the already-moored Cosco Seattle. If the Oslo was too far forward, trucks entering and leaving to carry away containers would get each other’s way and slow down the unload. 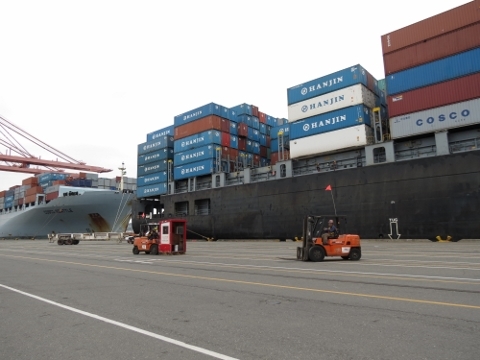 The terminal area was pretty empty and quiet when we arrived, and as we watched the ship dock. But once the ship had stopped, the place sprang to life. 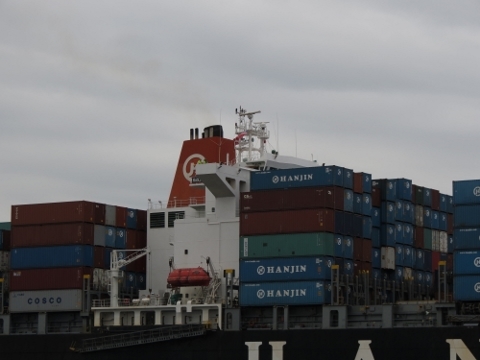 Forklifts buzzed about, trucks began arriving to pick up the containers, and various officials appeared to process the ship’s arrival into port. 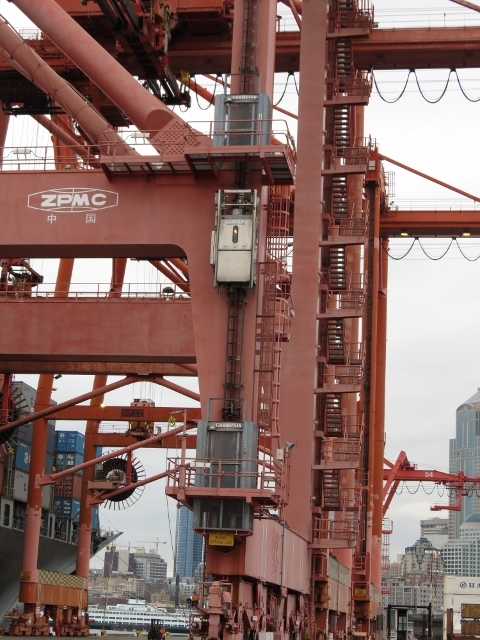 Crane operators whizzed to the top of their cranes in small elevators and moved the cranes into position. The video link at bottom left shows the cranes closest to us going into position. For such a large piece of equipment, it moves quickly. 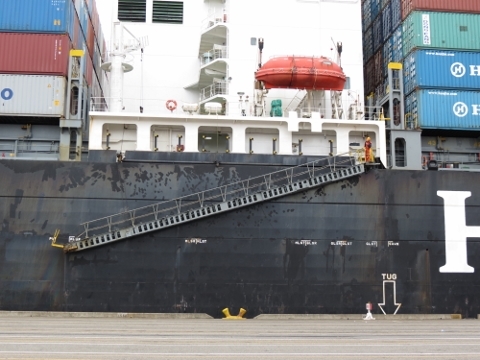 The walkway, that we would take to board the ship, lowering into position. 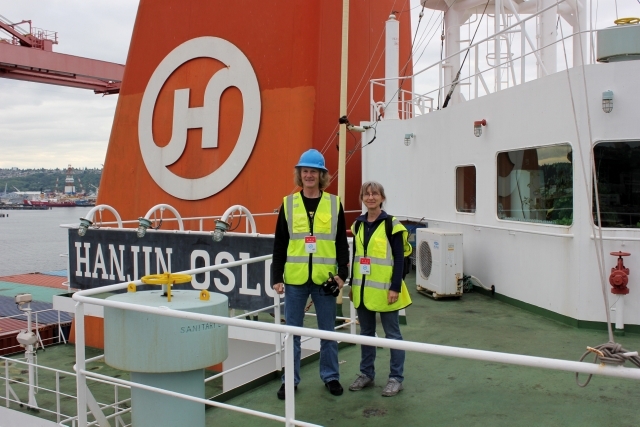 Peter took us on a tour of the yard first, and then we boarded the Oslo. 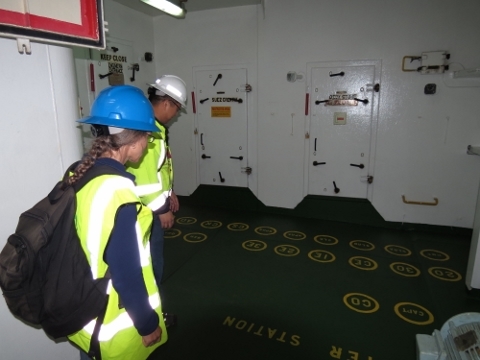 One of the first things we saw on board was the emergency muster station, with a labelled position for each crew member to ensure all are accounted for. 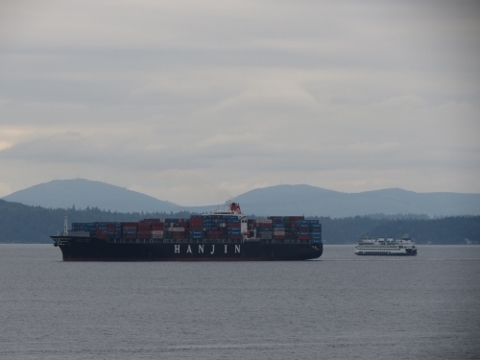 For such large ships, the crews are relatively small. The Oslo typically will have a crew of 21, or 22 if a cadet is on board. Our first stop was an officer’s room. There we met the captain and three members of the bridge crew, and had an enjoyable discussion with them before beginning the tour. 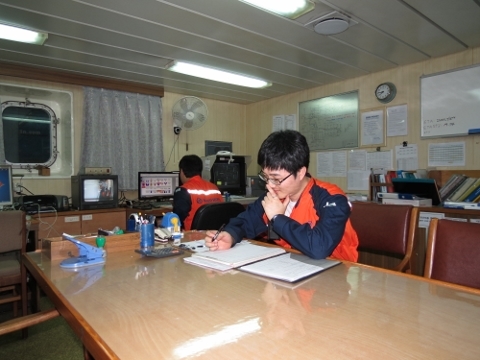 On the screen at the back of the room, they were monitoring the ship’s trim while ballast adjustments were made to compensate for weight distribution changes as containers were unloaded. 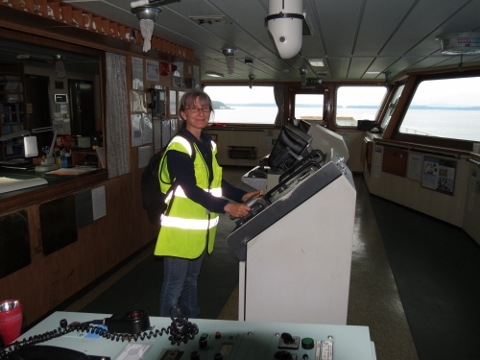 The Oslo’s third officer, also named Peter, took us on a tour of the ship, starting with the bridge. 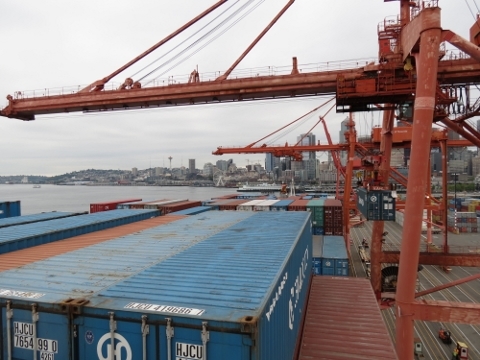 It was so wild to be on the bridge of a container ship. 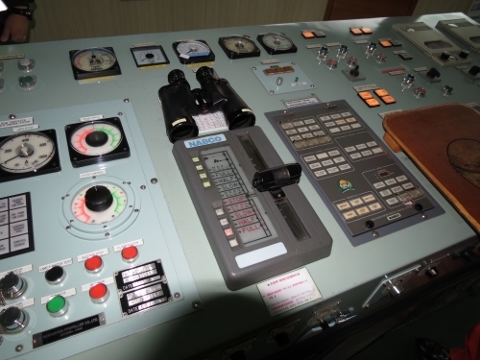 Peter, of the Oslo, explained the operations of the various equipment at the bridge, and let me “drive”. The Oslo‘s captain has a real green thumb. 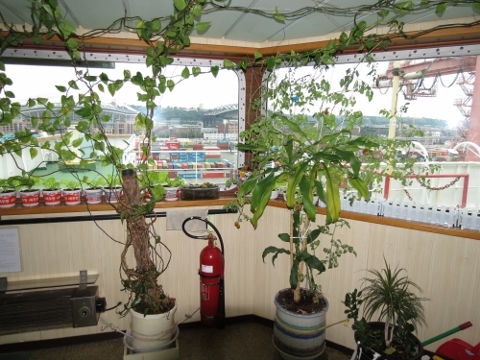 He was growing quite an extensive garden in the corner of the bridge, including an impressive tomato plant. The view looking forward and aft from the bridge wing. The long-range visibility is impressive, but is quite limited close-range–it’s a long way to the bow. Peter Kim commented that the you could lay the 605-foot Space Needle in between the bridge and that small white tower at the bow. Small boats just forward of the ship would simply be invisible from the bridge. 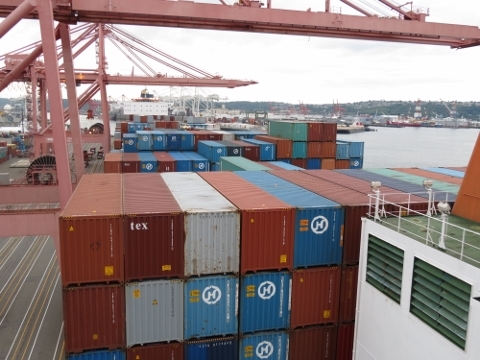 This Discovery Channel show on Container Ships, featuring the Hanjin Washington, shows how resticted the visibility is from the bridge when entering a port. 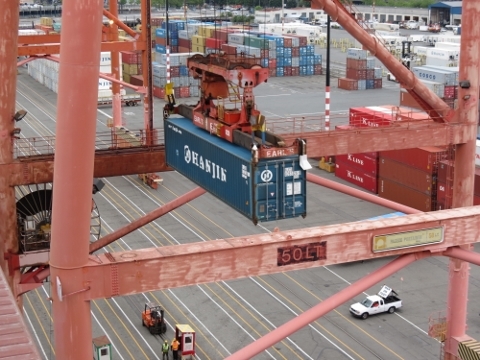 From the bridge wing, we had an excellent view of the containers being offloaded. 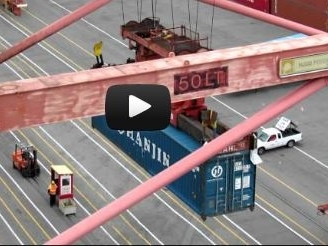 In the video linked at right, you can see how skilled and efficient the crane operators are at pulling a container out and depositing it onto a waiting truck. 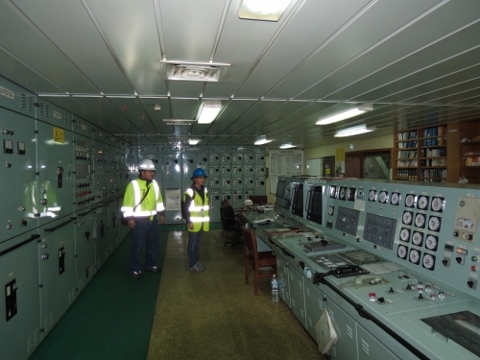 The next stop was the machinery monitoring room. 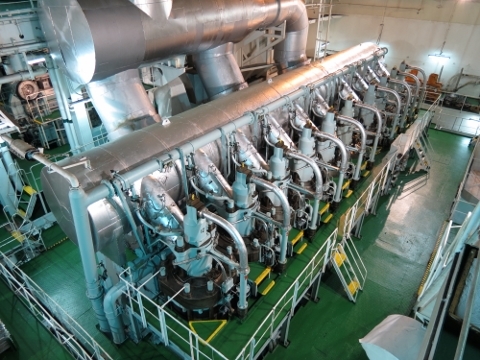 Besides the main engine, the Oslo has four auxiliary generators for producing electricity. We believe 2 are 2700 kw and 2 are 1700kw. 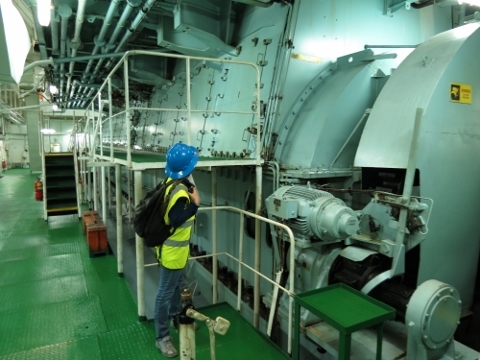 And then we got to see the engine. It’s absolutely huge. 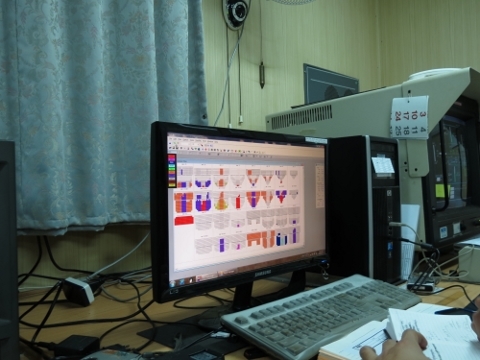 Peter Kim compared it to the equivalent of ten city buses stacked vertically. 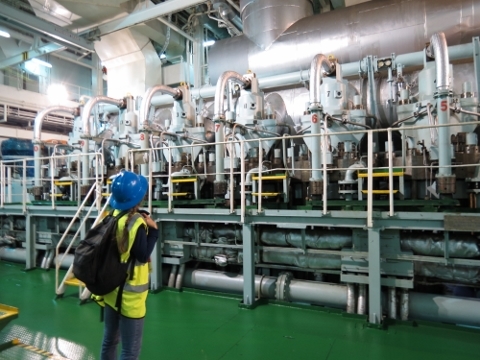 For more details on the engine, see Jame’s blog entry Visiting the Hanjin Oslo Container Ship. 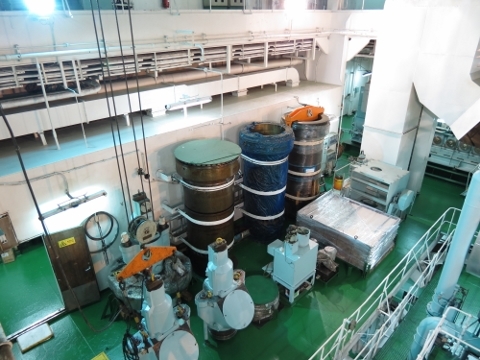 Below are two pictures from the top floor of the engine room. 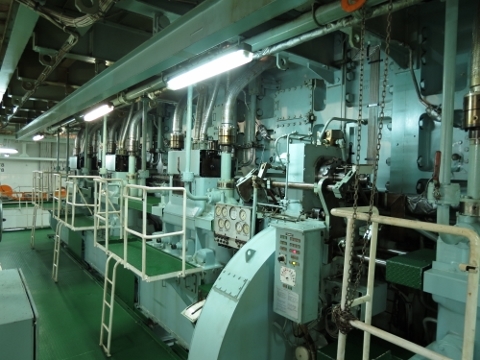 And these are the second and third floors down in the engine room. The prop shaft extends from the engine at the lower (third) level down. It’s incredibly huge, with massive supports. 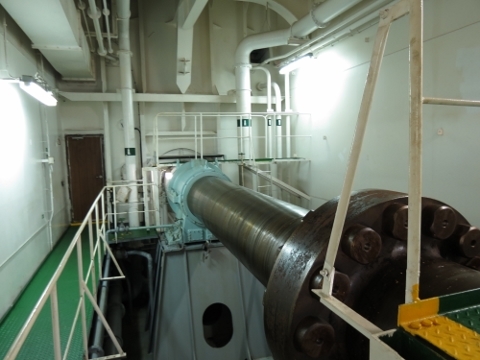 The last picture below is of various huge engine spares, include cylinders and sections of the prop shaft. Notice how clean and sparkling everything is. Peter had warned us before our tour that this was a working ship and would be dirty, but we’d been on cruise ships that weren’t as clean as the Oslo. There wasn’t a speck of dirt in evidence anywhere. We had an awesome time that afternoon. 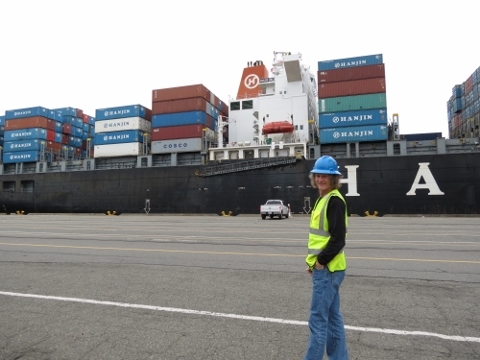 Thanks to Hanjin Shipping lines, the captain and crew of the Oslo, and Peter Kim for an incredibly informative tour.